Let’s face it, PCI-DSS compliance is a dreadful task for Merchant and Service Providers of all shapes and sizes. This is mainly due to the amount of time it takes to get through the assessment, not to mention the internal and external costs accrued each year. Furthermore, PCI-DSS requires that each company perform Internal and External Penetration Testing, Internal and External Scanning, Wireless Scanning and, for those companies that have websites, Web Penetration Testing. So, with all of this in mind, is there any way to lower the cost? Definitely! 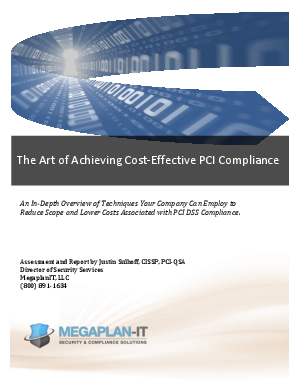 While there is no way to completely eliminate PCI assessments, especially if your organization plans to accept credit cards, there are proactive steps your team can take to reduce the scope and amount of time required to complete your next compliance project. By following these suggestions, your assessment costs will be dramatically decreased.